Frustrated with the current administration’s wackadoodle politics and its daily grind of mean-spirited tweets? Then let Dave be your panacea. This uplifting story is drawn from the 1993 eponymous movie written by Gary Ross and starring Kevin Kline and Sigourney Weaver. Remember that? Well, it’s now a musical written by Tony Award-winning composer Tom Kitt (Next to Normal, If/Then, Bring it On: The Musical, Freaky Friday and SpongeBob SquarePants: The Broadway Musical) and book writer/lyricist Nell Benjamin (co-writer with her husband Laurence O’Keefe of Legally Blonde, Mean Girls, Life of the Party, Huzzah!). We need this. We really, really need this! 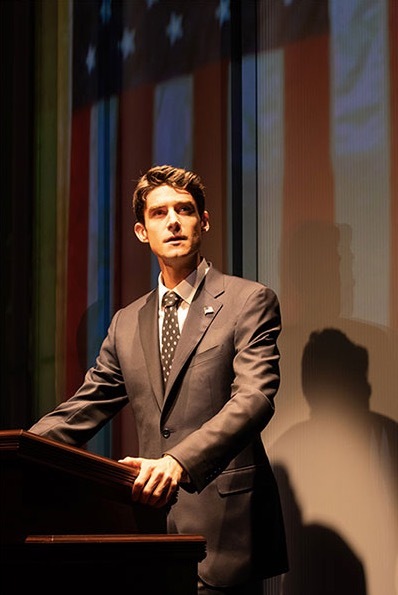 Drew Gehling (Dave Kovic/President Bill Mitchell) in Dave, running July 18-August 19, 2018 at Arena Stage at the Mead Center for American Theater. Photo by Margot Schulman. Director Tina Landau (SpongeBob SquarePants: The Broadway Musical and many more) has achieved an astonishing assemblage of A-Plus experienced cast, crew and creators to produce a musical that soars in every category – choreography, sets, actors, musical numbers and lighting. Set Designer Dane Laffrey and Projection Designer Peter Nigrini have conceived a sensational, floor-to-the-rafters cyclorama embedded with LED projections that changes scenes at the proverbial drop of a hat. It’s not just cleverly conceived, it’s mind-blowing. Set in Washington, DC, our hero, Dave Kovic (Drew Gehling) is a recently fired liberal-leaning, Abraham Lincoln-loving high school teacher who decides to take up posting YouTube videos of himself doing impressions of the current President, Bill Mitchell (also Gehling). When POTUS suffers a stroke whilst in flagrante delicto with his girlfriend, Randi (Rachel Flynn), Dave is summoned to act as his secret stand-in. He’s so convincing that FLOTUS, Ellen (Mamie Parris) and VP Nance (sounds like… oh, never mind… played by Jonathan Rayson), can’t tell it’s not Mitchell. The only ones in on the ruse are the Secret Service, his Director of Communications, Susan Lee (Bryonha Marie Parham), and his devious Chief of Staff, Bob Alexander (Douglas Sills). 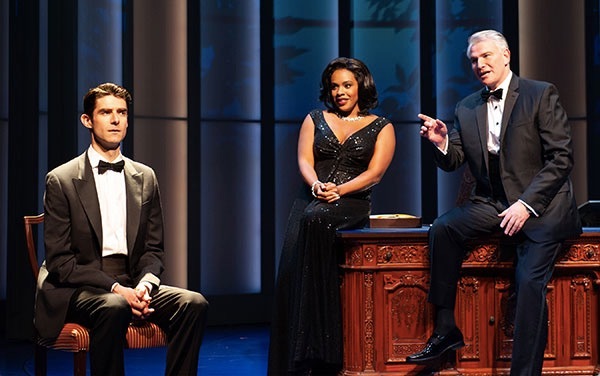 (L-R) Drew Gehling (Dave Kovic/President Bill Mitchell), Bryonha Marie Parham (Susan Lee) and Douglas Sills (Bob Alexander) in Dave, running July 18-August 19, 2018 at Arena Stage at the Mead Center for American Theater. Photo by Margot Schulman. Up till the switcheroo, Lee and Alexander had been serving a President who was a self-consumed, self-aggrandizing idiot, demeaning to his wife while unceremoniously wrecking the country. Sound familiar? Meanwhile, Dave becomes more and more irreplaceable as his poll numbers continue to soar and the country (along with the audience!) cheers on his progressive agenda. While POTUS is still in a coma, Dave feels guilty continuing the subterfuge until the ghosts of former Presidents – Buchanan, Taft, Harding, Harrison, Johnson, Hayes and John Quincy Adams – appear to him in the Lincoln Bedroom to convince him otherwise in one of the show’s most hilarious scenes. Imagine the Secret Service as an armed-and-dangerous chorus line fronted by the President’s Chief of Staff. Now, you’ve got the picture. 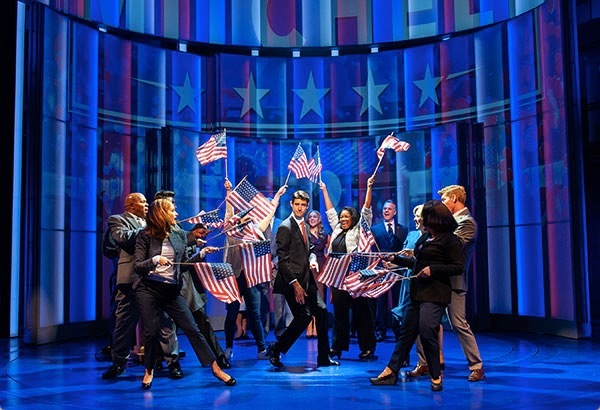 It’s a feel good, validating, change-the-world, political comedy musical with a flawless cast that will have you cheering all the way home. Highly recommended. A total hoot from beginning to end. Drew Gehling (Dave Kovic/President Bill Mitchell) and the cast, in Dave, running July 18-August 19, 2018 at Arena Stage at the Mead Center for American Theater. Photo by Margot Schulman. Book by Thomas Meehan and Nell Benjamin, Set Design by Dane Laffrey, Choreography by Sam Pinkleton, Orchestrator Michael Starobin, Music Director Rob Berman, Costume Design by Toni-Leslie James, Lighting by Japhy Weideman, Sound Design by Walter Trarbach, Projection Design by Peter Nigrini. In the Kreeger Theater through August 19, 2018 at Arena Stage, 1101 Sixth St., SE, Washington, DC 20024. For tickets and information call 202 488-3300 or visit www.ArenaStage.org.